In the last issue of “Show Business” we announced the availability of new logos for every title in the R&H Theatricals catalogue. As you know, R&H now provides this new artwork on a user-friendly CD that is shipped to you with your script and musical materials. As an added bonus, you can now order this new artwork on custom tee shirts, posters and program covers from Stage Promotions. Logo artwork is so important to your production. It creates a visual impact and is the primary means by which you spread the word about your production. This impact is often achieved by the use of posters placed around town. These are frequently self-produced and many times do not reflect the high quality of your production. What you want are high-quality, well-produced, glossy posters with your performance information (venue address, performance dates and box office number) clearly displayed. This is the kind of product Stage Promotions has been providing to our customers for a growing number of titles for 10 years. 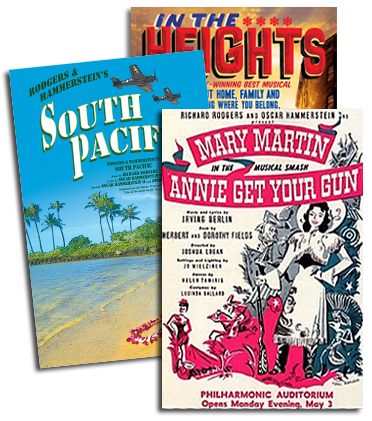 Now, with the addition of our new logos, you can get the same product from Stage Promotions (www.stagepromotions.com) for any title in the R&H Theatricals catalogue. And, you can increase your market penetration with the use of custom tee-shirts. Think of your cast, crew and orchestra members going about their daily business in beautifully crafted tee shirts that not only display an eye-catching logo but also announce the what, where and when of your performances. You’ll be able to establish your production as a brand in your area with this integrated promotional approach. 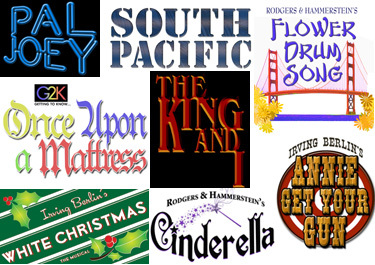 You can self-produce tee shirts to make available to your cast and crew, either as a keepsake souvenir or for sale at cost, but you must obtain a license (in addition to your performance rights license) from The Rodgers & Hammerstein Organization (RHO) for a nominal licensing fee. You can order customer-made tee shirts bearing our approved logos from Stage Promotions to make available to your cast and crew, either as a keepsake souvenir or for sale at cost, and pay only the order fees to Stage Promotions – and remember Stage Promotions does not require minimum orders per size. You can self-produce or order from Stage Promotions tee shirts for sale to the general public but you must obtain a proper merchandising license from RHO. Don’t miss a valuable opportunity to build your audience and increase your ticket sales. Order promotional items from Stage Promotions today.